The precision straightening process is second in importance and represents the best third way between a simple straightening and a fine leveling. It is commonly used with thin materials, where the final product requires a very good level of straightening. Precision straightening is a simple and always quick process to obtain flat sheet metal by its passage through a number of rolls in different diameters, which varies according to the thickness of the sheet to straighten. The manufactoring process is not much different from those of normal straightening, but is a lot more similar to a fine leveling, thanks to the presence of a number of counter-rolls. These rolls can be of 25, 30, 40, 50, 65, 80 or 100mm diameter. The choice of the best diameter is essentially based on metal width and the degree of straightness one wants to obtain. Normally, these diameters are used for a range of widths that varies from 0.5 mm to 6.35 mm, but it is also true that thinner material require more rolls than those needed for thicker ones. Precision straighteners, however, cannot replace a fine leveller in any way. 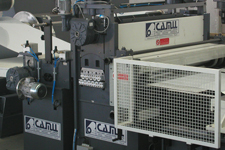 A precision straightener is a multi-cylinder machine that exerts “alternated plastic deformations” onto the materials through their rolls, but with the addition of fixed counter-rolls. Like every straightener, even precision ones are equipped with a quantity of rolls odd in number and arranged in two rows: the bottom one with more rolls and the upper one, whose pressure on the sheet metal can be adjusted manually or automatically. All working rolls are motorized by a special distribution cage and are responsible for the pressure exerted on the sheet, thus determining the degree of straightness one wants to obtain. The operator is tasked with the ability to choose the optimal degree and this is why his experience, as well as the choice of a good coil and facility rigidity can make the difference. 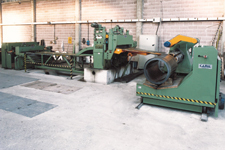 For a greater straightening quality and counterbalancing rolls flexure, some series of counter-rolls are inserted and set on a rigid structure to allow for a good result. Usually, precision straighteners comprise 11 or 13 rolls. 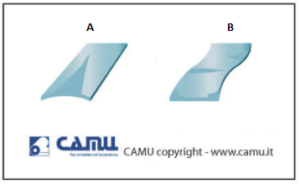 Camu’s flexibility allows devising the best solution according to our client’s specific needs. It is highly recommended to carefully clean the precision straightener before changing into a different type of material in order to ensure maximum efficiency and avoid any marks or blemishes on the end product. Backup rollers supported by massive top and bottom frames along the full face. These framse are used to minimize work roll flection under load. Vertical lifting of upper working plan through special mechanical jacks powered with eletrical motors. Self-stabilizing movement and penetration of upper working plan powered with eletrical motors.